Cleaning right to the fibre tips! If you don't just use your wet/dry vacuum cleaner in one place, but also remove dirt from many different places, it is best to use flexible devices. This is why we have not only equipped our wet/dry vacuum cleaners with agile and stable rollers, but also developed special models with battery operation. Powered by our powerful Power X-Change batteries, you can enjoy cordless freedom with these vacuum cleaners, making them more flexible both indoors and in outside areas. What's more, the batteries from the wet/dry vacuum cleaner can also be used in all other devices in the Power X-Change range. Whether you're cleaning up dry dirt or liquids, it makes no difference to the cordless wet/dry vacuum cleaner. Thanks to this battery-powered freedom, the cordless wet/dry vacuum cleaner has an unrestricted working radius. All of our wet/dry vacuum cleaners are fitted with a special blowing connection. This allows even hard-to-reach places to be blown out easily and thoroughly. And it can also help with many other activities, such as leaf blowing in the garden. Choose the right battery for your product! Whether cleaning the workshop, the home, the garden or for cleaning your car. 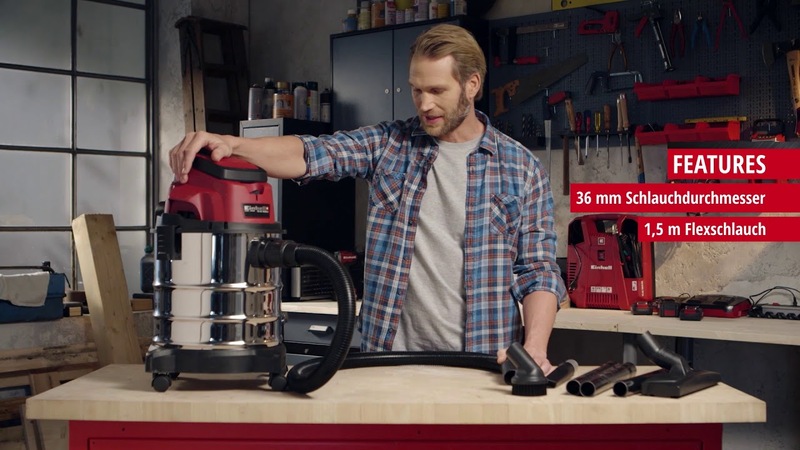 With the Einhell Battery Advisor you will find the right combination of wet-dry vacuum cleaner and Power X-Change battery!